working with suppliers & SMEs to support responsible business practice. The APCRG first launched its Responsible Business Champions scheme in 2015, with the support National Grid. The Scheme is now supported by Anglian Water Services Limited, BITC's Responsible Business of the Year 2017. It was set up to encourage MPs to take a close interest in whether companies in their constituencies are operating responsibly and to celebrate the achievements of their best local companies with the Group. Each year MPs are invited by the APCRG to identify an outstanding local business which, because of its positive impact in their constituency, deserves to be nominated as their Constituency Responsible Business Champion. A Parliamentary judging panel then considers the companies nominated by MPs against national criteria announced each year by the APCRG and selects one company as the winner of the APCRG National Responsible Business Champion award. MPs are sent certificates by the APCRG to present locally to their Constituency Responsible Business Champion. Nominating MPs are also invited to bring a representative of their Constituency Responsible Business Champion to the annual Responsible Business Champions reception in Parliament at which the APCRG National Responsible Business Champion award is presented. Jonathan Djanogly MP and Baroness Greengross, Co-Chairs of the All-Party Parliamentary Corporate Responsibility Group (APCRG), announced on 4 July that BAE Systems Land UK had won the APCRG's 2018 National Responsible Business Champion award. 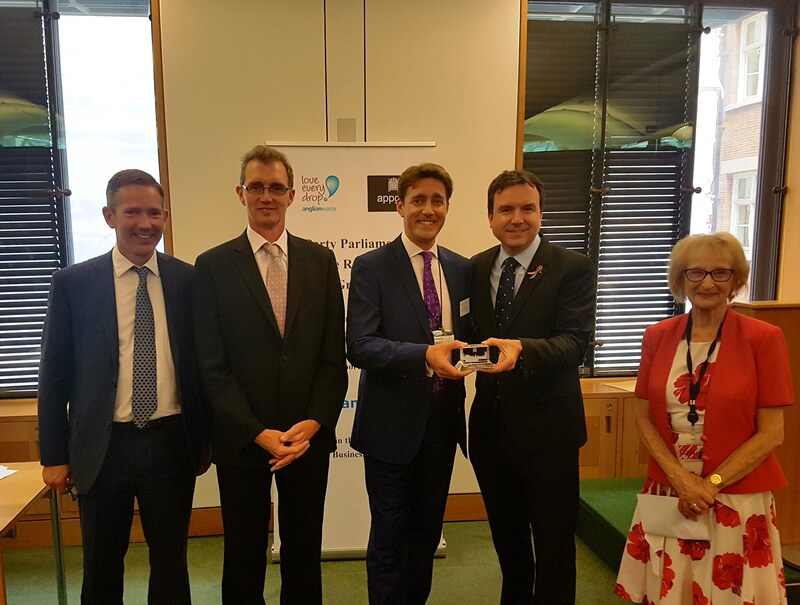 Richard Brown, External Communications Manager for BAE Systems Land UK, was presented with the 2018 National Responsible Business Champion award by Andrew Griffiths MP, the Minister for Small Business, Consumers and Corporate Responsibility. The APCRG Responsible Business Champions scheme is supported by Anglian Water, Business in the Community's Responsible Business of the Year 2017. Peter Simpson, CEO of Anglian Water, congratulated all the companies nominated as Constituency Responsible Business Champions by their MPs. Anglia Water applauds the APCRG's wish to encourage businesses to operate responsibly themselves and to help suppliers and other SMEs to develop and adopt responsible policies. Peter Simpson spoke about the difference companies can make to local communities when they are committed to helping, willing to collaborate with others and prepared to make a sustained effort. BAE Systems Land UK, nominated by David TC Davies MP (Monmouth), was chosen by a Parliamentary judging panel which looked at nominations from MPs representing constituencies across the UK. The runner-up for the National Responsible Business Champion award was Ardross Farm Shop, nominated by Stephen Gethins (North East Fife); Home Instead Senior Care (UK) Ltd, nominated by Faisal Rashid MP (Warrington South) was third placed. Three other companies - Anglo Recycling Technology Ltd nominated by Jake Berry MP (Rossendale and Darwen); Morley Hayes nominated by Pauline Latham (Mid Derbyshire) and Senior Aerospace Bird Bellows nominated by Fiona Bruce (Congleton) were highly commended by the Parliamentary judging panel. The full press release can be found here. 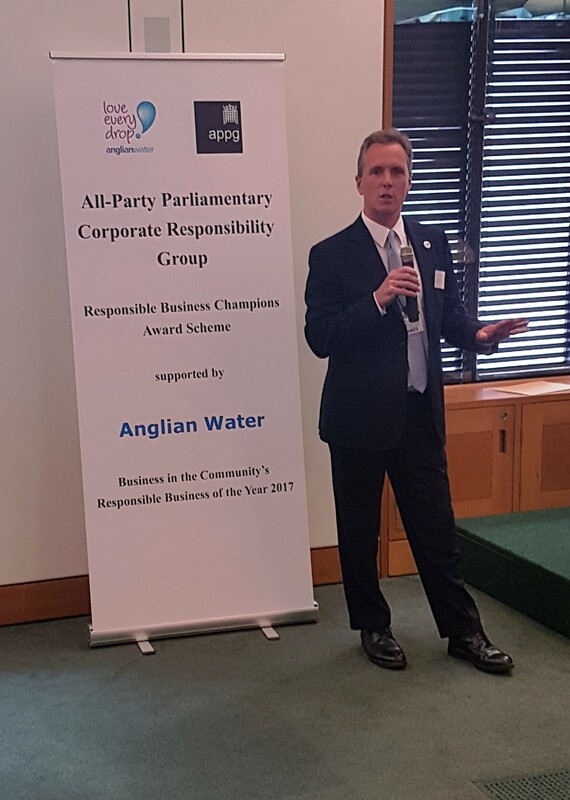 The APCRG Co-Chairs, Jonathan Djanogly MP and Baroness Greengross, have announced the companies short-listed for the Group's National Responsible Business Champions award 2018, kindly supported by Anglian Water. The accompanying Press Release can be found here. The winner of the national award will be announced at the APCRG's Responsible Business Champions reception on 4 July, when Andrew Griffiths MP, the Minister for Small Business, Consumers and Corporate Responsibility, will present the winning company with the APCRG National Responsible Business Champion award 2018. The Co-Chairs also announced that Anglian Water Services Limited will be the new sponsor of the Responsible Business Scheme. Jonathan Djanogly MP said: "I invited Anglian Water Services to join the APCRG in 2015 because I knew it is a fantastic company, one which I was delighted to nominate as my own Constituency Responsible Business Champion in 2016 because it has led best practice on many issues, especially inclusion, well-being and sustainability. In 2017 Rebecca Harris nominated it as her Constituency Champion for its strong leadership on flood risk reduction and resilience work, as well as its commitment to inclusion, wellbeing and the health of its employees. For all these reasons we are delighted that Anglian Water Services will be supporting the Responsible Business Champions scheme until 2020." Jonathan Djanogly MP and Baroness (Sally) Greengross, the APCRG Co-Chairs, announced the longlist of companies nominated by MPs for the 2018 APCRG National Responsible Business Champions Award on 14 June. Jonathan Djanogly MP and Baroness Greengross, Co-Chairs of the All-Party Parliamentary Corporate Responsibility Group (APCRG), announced on 22 November that Zurich Insurance has won the APCRG's 2017 National Responsible Business Champion award. 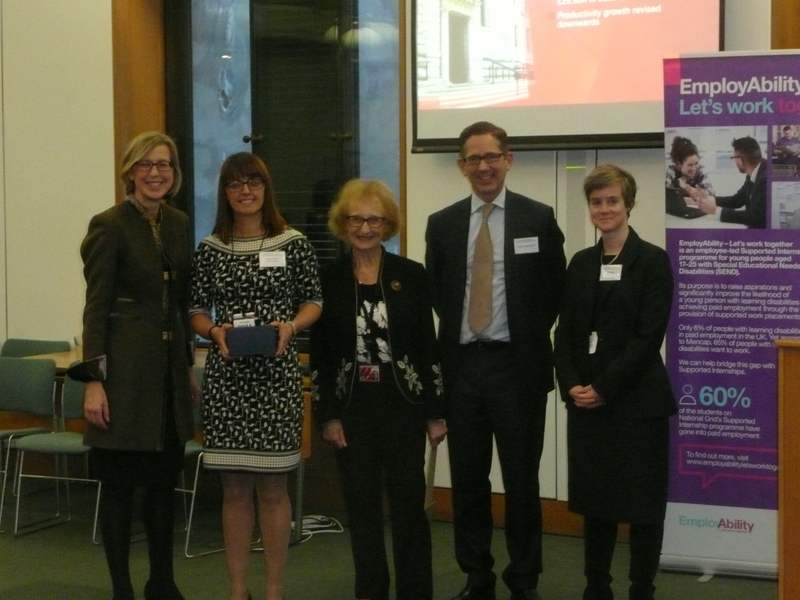 Sophie Timms, Head of Media, Public Affairs and Corporate Responsibility for Zurich Insurance, was presented with the 2017 National Responsible Business Champion award by Sarah Newton MP, the Minister for Disabled People, Health and Work, at a reception in Parliament. The APCRG Responsible Business Champions scheme is supported by longstanding APCRG member National Grid plc, Business in the Community's Responsible Business of the Year 2014/15. Rhian Kelly, Head of Public Affairs at National Grid, congratulated all the Constituency Responsible Business Champions on being nominated by their MPs and spoke briefly about National Grid's EmployAbility programme through which it provides supported internships for young people with learning disabilities aged 17 - 25 and a toolkit they have created to help other employers. Zurich Insurance was nominated by Justin Tomlinson MP (North Swindon) It was chosen by a Parliamentary judging panel which looked at nominations from MPs representing constituencies across the UK. The runner-up was Standard Life Aberdeen, nominated by both Ian Murray MP (Edinburgh South) and Christine Jardine MP (Edinburgh West); Thanet Earth, nominated by Sir Roger Gale MP (North Thanet) was third placed. Three other companies were highly commended by the Parliamentary judging panel: Anglian Water Services Ltd nominated by Rebecca Harris MP (Castle Point); intu properties plc nominated by Kate Green MP (Stretford and Urmston); and Marks and Spencer plc (Basingstoke) nominated by Rt Hon Maria Miller MP (Basingstoke). The full Press Release can be found here. The APCRG Co-Chairs, Jonathan Djanogly MP and Baroness Greengross, have announced the companies short-listed for the Group's National Responsible Business Champions award 2017, kindly supported for a third year by National Grid. The accompanying Press Release can be found here. The winner of the national award will be announced at the APCRG's Responsible Business Champions reception on 22 November, when Penny Mordaunt MP, the Minister of State for Disabled People, Health & Work will present the winning company with the APCRG National Responsible Business Champion award 2017. Companies long-listed can be found here along with the accompanying Press Release. 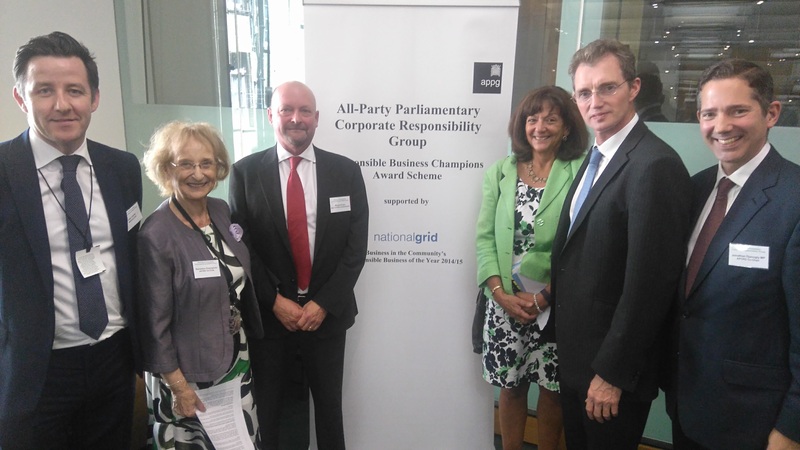 Jonathan Djanogly MP and Baroness Greengross, Co-Chairs of the All-Party Parliamentary Corporate Responsibility Group (APCRG), announced on 6 July that Alun Griffiths (Contractors) Ltd has won the APCRG's 2016 National Responsible Business Champion award. Alun Griffiths (Contractors) Ltd received the award for which the company had been nominated by David TC Davies MP (Monmouth). 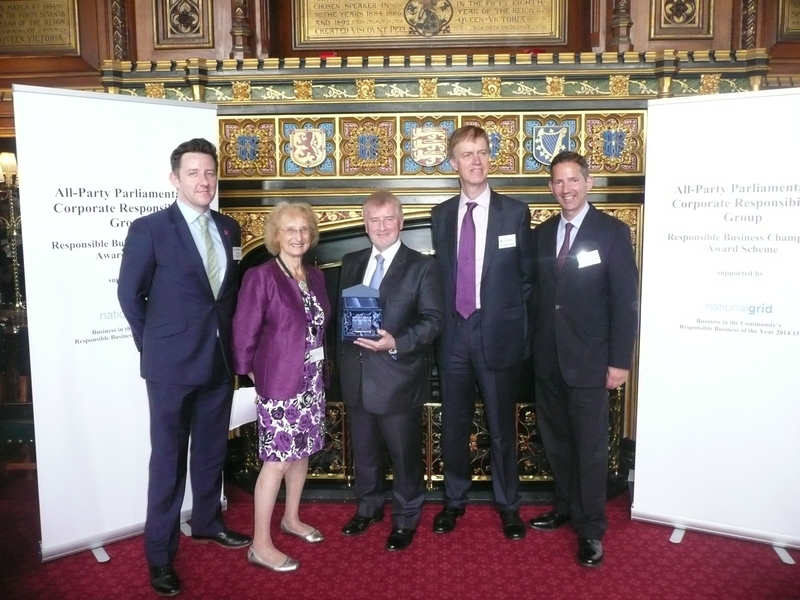 The APCRG National Responsible Business Champion 2016 was presented with the 2016 National Responsible Business Champion award by the Business Secretary, Sajid Javid, at a reception in Parliament. The APCRG Responsible Business Champions scheme is supported by longstanding APCRG member National Grid plc, Business in the Community's Responsible Business of the Year 2014/15. Alun Griffiths (Contractors) Ltd, nominated by David TC Davies MP (Monmouth), was chosen by a Parliamentary judging panel which looked at nominations from MPs representing constituencies across the UK. The runner-up was Zurich Insurance, nominated by both Robert Buckland MP (South Swindon) and Justin Tomlinson MP (North Swindon); Canary Wharf Group, nominated by Jim Fitzpatrick MP (Poplar and Limehouse) was third placed. Three other companies: Anglian Water Services Ltd, nominated by Jonathan Djanogly MP (Huntingdon); Port of Blyth nominated by Ronnie Campbell MP (Blyth); and Xiros Limited nominated by Greg Mulholland MP (Leeds North West) - were highly commended by the Parliamentary judging panel. The full details of the 2016 award winner and all the companies nominated can be found here. London City Airport was the winner of the Group's first National Responsible Business Champion award. Fujitsu UK and Urban & Civic plc were highly commended by the judging panel and Marks & Spencer (Loughborough), nominated by Rt Hon Nicky Morgan MP, was the runner up for the 2015 award. Declan Collier, Chief Executive of London City Airport, received the award for which the company had been nominated by Rt Hon Stephen Timms MP (East Ham). The full details of the 2015 award winner and the 10 companies short-listed for the APCRG National Responsible Business Champion award can be found here.